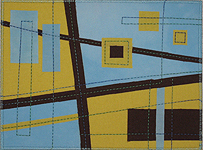 Explore textiles and surface design in this exciting and dynamic experimental class. Students will learn how to add pattern to cloth with resists, rust, dye, and textile paints. Investigate many surface design avenues including: imagery transfer methods, hand created stamps and stencils, and found objects in order to alter the textile surface. Textiles created in this class can be used in a multitude of ways including art cloth, art quilts, sewing or book projects. Ever need a specific image or texture for a quilt to solve your creative problem? Explore surface design screen printing options in this exciting and dynamic experimental class. Students will learn how to add pattern to cloth with low-tech screen printing methods. Techniques include soy wax resists, discharge, stencils, painting and more. Investigate layers to create cloth with depth and complexity. Explore the principles of color theory and design (balance, rhythm, proportion, contrast, emphasis and unity) and how to use them in art quilt compositions. Using creative design exercises, investigate how colors interact with each other and how to make color work for your artwork. Learn the basics of color theory.Access knowledge of how colors interact with each other, feelings of colors, etc. Gain confidence in your color decisions and understand how to use fabric to say what you mean! Explore the world of creating your own unique books. The class will cover the foundations of bookmaking, with opportunities for exploration of new book forms and techniques for more experienced students. Learn the technical skills involved in making book forms through the creation of blank books that are both sewn and glued. Explore how to design and create one-of-a-kind or editions of conceptual artist’s books that marry form and content for a unique expression. Ideas will be investigated for the seamless inclusion of text and imagery in artist’s books. Special emphasis will be placed on special methods and ideas for using textiles to create unique handmade books. 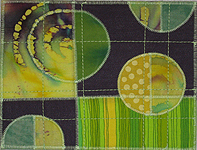 Explore the use of fabric postcard techniques for journal quilting to chronicle experiences or to try ideas for larger quilts on a small scale. Delve into techniques to create abstract compositions using hand or machine embellishment. Explore ways to create beautiful dyed or discharged fabrics using hand stitched or clamp shibori techniques. 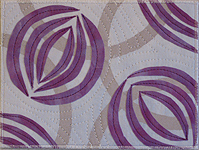 Learn multiple shibori stitches and patterns including karamatsunui, makinui, and awasenui. Employ the basics of low immersion synthetic dye techniques to transform your freshly stitched shibori samples into colorful surface designed originals. The class is geared towards shibori beginners and will cover the foundations of stitched shibori resists. 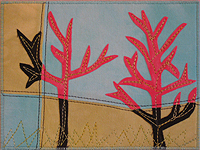 Explore Naomi’s art quilts and surface design techniques and inspiration. Digital slideshow or actual trunk show based upon travel arrangements. Learn how to assess how you work and your quilting processes.Use this information to reorganize and rethink your quilting space so it is working for you! 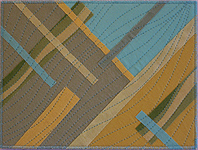 Gain useful information about storage, organization, and ergonomics as they relate to quilting.